Lepide Auditor for File Server ensures comprehensive security for risk free data sharing along with keeping compliance problems aside. 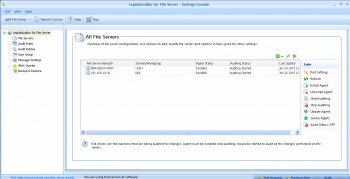 LAFS tracks, audits and reports all files, folders, and permission changes from Windows File Servers and NetApp Filers. LAFS offers automated auditing solutions for File Servers to safeguard the organization against interventions, illegal access and permission changes. Well some days back i have to audit all my files and folders. It was an incident where 1/4 of my employees were sharing the files and folder from the server without my knowledge that was on -to-totall they were breaching companies rules and policies. It was Lepide Auditor for file server that helps me to generate a real time alert report that has conclude me to knowledge that who, were those people that were doing this crime. Today its feel good to recommend some as an answer to use Lepide Auditor for File Server. LepideAuditor for File Server can track each & every activity which is happening in the files & folders of a file server.